Well, I was going to get one of these, but now I see that it doesn’t have an interface for searching and selecting movies. You have to first log into your Netflix account and add the movie to your queue using your computer. The Roku Netflix Player only allows you to browse titles in your Netflix Instant Queue. The other problem for me is the lack of buffer (the player only has 256MB of RAM) and reports of barely passable video quality (due to bandwidth limitations). Roku recommends a minimum 1.5Mbps connection; movies average a bit-rate of 2.2Mbps. Now that I’ve got HDTV over satellite, the last thing I want to do is step backwards to something less than standard 480p DVD. 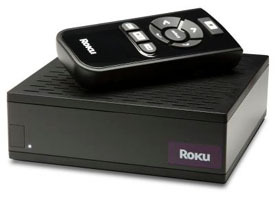 I’d rather wait a little while for a higher quality bitrate video to download than suffer poor video quality if my connection can’t keep up in real-time – especially for HD content (the Roku doesn’t support HD yet, but is supposed to in the future). So that means a box with a lot more RAM (or flash, or a small hard disk), which probably means it will cost more than $99. Don’t believe what you’ve heard regarding quality. If you have a decent internet connection (cable or fiber, not DSL CRAP), you won’t be disappointed. We watched Pan’s Labyrinth on our 52″ LCD and couldn’t tell the difference between the DVD version and the streaming one. Definitely equal to AppleTV and with HD in Beta…soon to be better! Did this ever take off? It seems I’ve seen others like this but not this particular model and its abilities Just researching to find whats best out there right now.